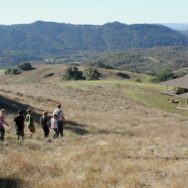 The Pepperwood Preserve is a beautiful private reserve just outside Santa Rosa. One of their key missions is to work with youth teaching them about the outdoors and the many important ecological elements that the Preserve protects. Recently I was asked to work with Pepperwood on a video piece to highlight their education programs. Click this link to see this video on Pepperwoods website.